Situated on the west side of Mt. 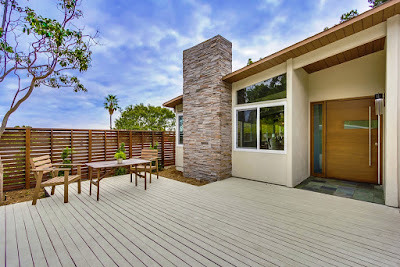 Soledad in San Diego, California sits the mid-century modern enclave of Pacifica, an early 1960’s Palmer & Krisel tract with commanding views of Mission Bay. 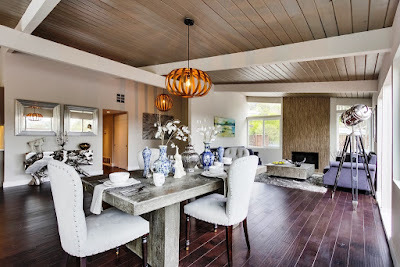 Like many Palmer & Krisel subdivisions, many of the homes have been reinterpreted as Tuscan, Craftsman or Hacienda estates, or have had their modest footprints added onto until the properties become amorphous blobs; however there is a growing constituency of owners who understand, appreciate and embrace the mid-century modern roots of these homes. Today’s mission dollar Monday fits the latter, and embraces the modern architecture of the home while providing thoughtful updates and interpretations that make sense and compliment the property. 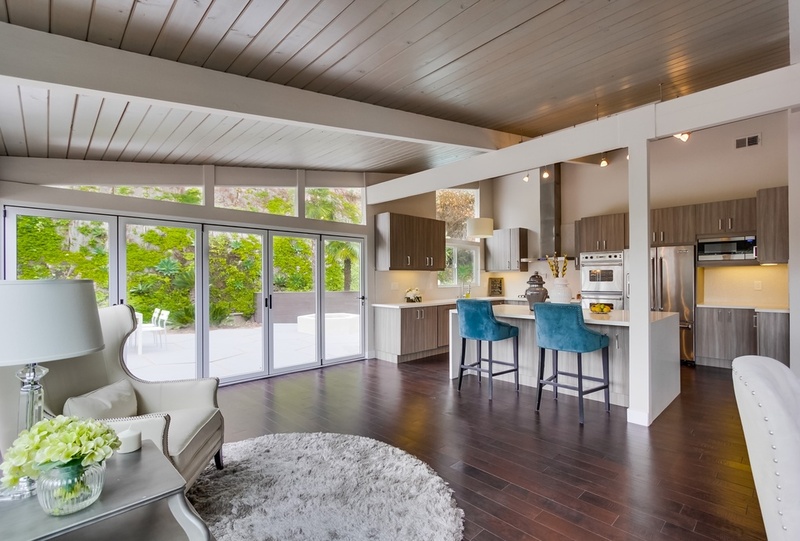 This home is four bedrooms, three bathrooms with a two car garage on a 7,800 square-foot lot with an asking price of $1,150,000, and was recently featured in San Diego’s Dream Homes Magazine. The curb appeal on this Krisel is fantastic – modern, simple and keeping in the style of the home. The two-car garage has been updated with an opaque glass garage door, while all the clerestories have been maintained. A modern horizontal slat fence adds privacy to the front yard, while drought tolerant vegetation dots the berm at the front of the property. A floating pad driveway adds interest to the front without being competitive with the architecture of the home while softening an otherwise harsh area. The front yard incorporates a seating deck behind the front fence, and leads visitors to the wide contemporary front door. Once inside, the entry opens up to the great room, offering up glass-walled views of the backyard, side yard and pool area. The living room sits at the front of the home, and is anchored by the fireplace which has questionably been stripped of its signature Krisel elements (decorative block and simple massing) and replaced with a stacked stone veneer which updates it to a 2015 look, yet diminishes the original integrity of the design. 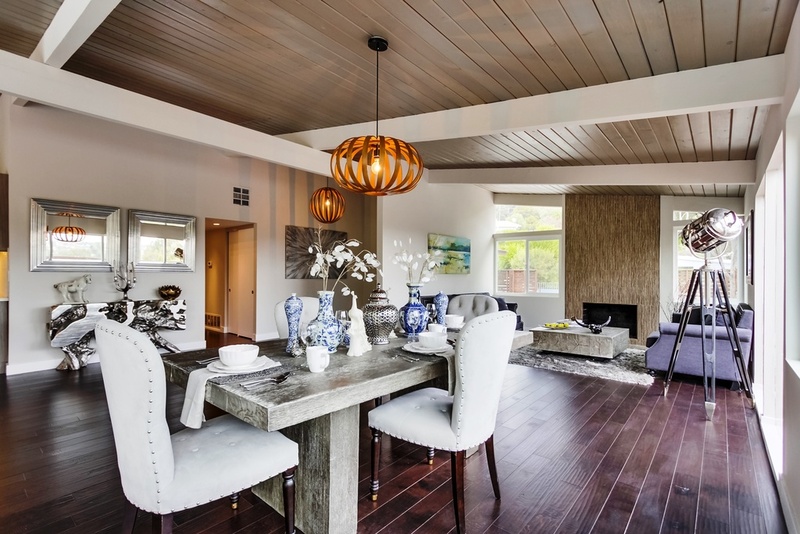 The remainder of the home is virtually flawless. Lightly ash stained tongue and groove open-beamed ceilings unite the living areas, while the kitchen features quiet, modern cabinets and counters that meet the modern simplicity of the design of this property. The appliances are Viking stainless steel, and the lighting is subtle, quiet and appropriate for the area. 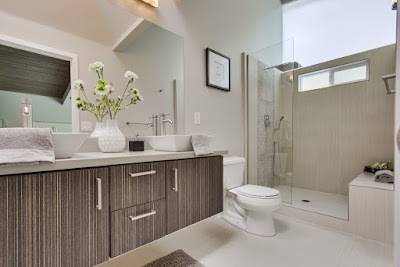 The master has been expanded granting additional living space, and the baths have been updated with a nod to the past, featuring floating vanities complimented either with low-profile vessel sinks and under mount sinks. The showers remain open and bright, using clean, simple materials that don’t over power the space. 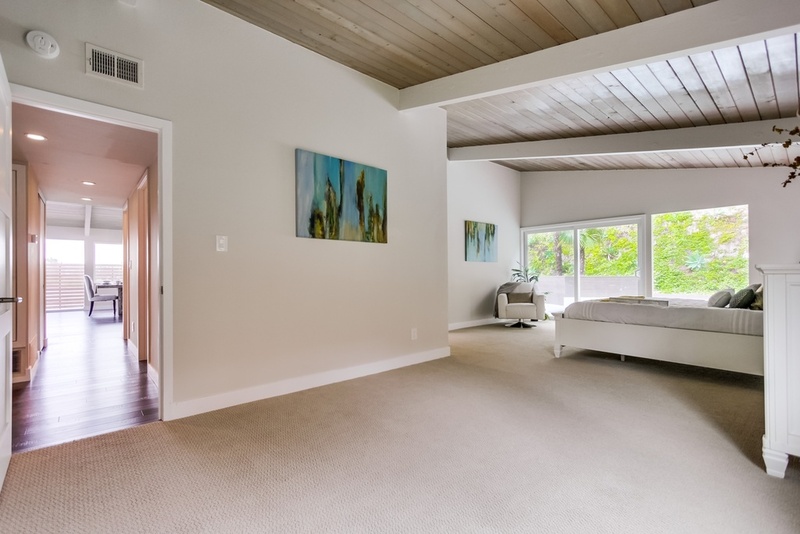 The remaining bedrooms show light and bright with their vaulted ceilings, neutral paint and light-carpeted flooring. Out back there’s a swimming pool plus spa. 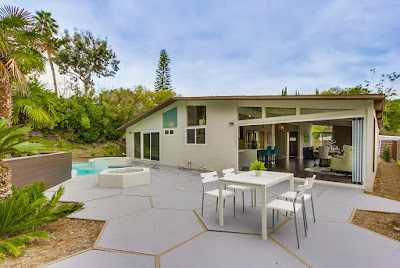 We love the honeycomb concrete patio, matching fire pit and hot tub. 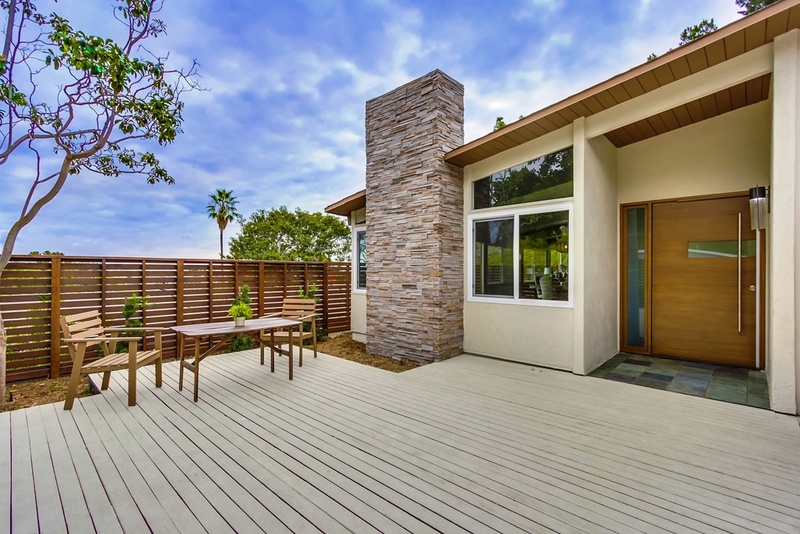 The living area features a wide-opening sliding glass door, perfect for enjoying the mild San Diego weather. 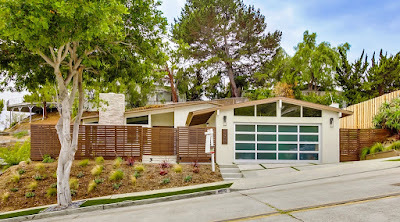 Overall this 1961 Palmer & Krisel is a stunning example of good design and smart choices, and will most likely sell quick, with Redfin predicting this to be a hot home with a high chance of selling within the next few days.